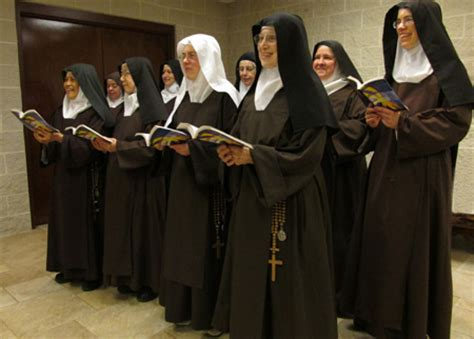 I saw someone mention on another forum a "spanish style" habit of some carmelite nuns and I was wondering if there is a difference between french and spanish habits? specifically carmelite habits? We are all in different time zones here at times - I am in South Australia and 11.46am on Wed 13th March here just now. I can't answer your question but I know that there are a few members who will be able to do so when they sight your post. 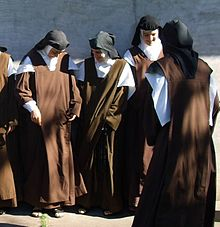 Many Spanish Carmelites tend to have the large toque, which you can see from behind in the first picture. The most notable difference is the toque (the white cloth that covers the shoulder) - Spanish toque tends to extend out (large part of the white cloth peeks out) of the scapular while French toque while it also extends out of the scapular, only small portion peeks out. The Spanish toque tends to be larger and extends out more. Shirring are found on both Spanish and French day veils (under veil) but not all. Some Spanish day veils no longer has shirring nowadays, some French day veils also, are no longer shirred. After Vatican II, a lot has changed even to the traditional habit. 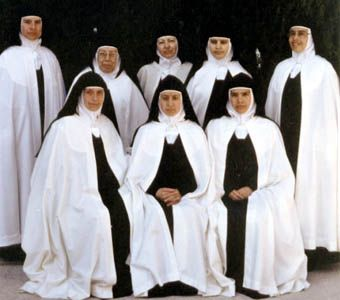 I Think before Vatican II, all Carmels founded directly from Spain wore shirred veils (day veils) but this changes after Vatican II. I read somewhere that when Anne of Jesus and company arrived in Spain, they were asked to alter the habit a little bit conform to French religious habit style during that time. The Spanish style is too foreign for the French taste. It was really a minor difference. I'm not sure if it was Cardinal Berulle who asked or someone else.